Larger units and more buildings in public transit-accessible suburban locations are two of the trends to look for in the Greater Toronto Area condominium market. 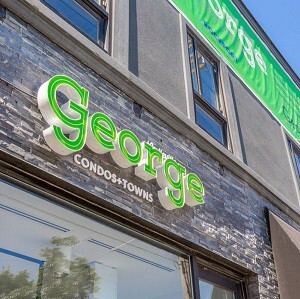 The Rockport Group’s George condos and townhomes in Toronto’s Leslieville neighbourhood reflect new trends. “Some of us have to go out to the suburbs. Not because we want to, but because there aren’t opportunities, or they’re that much more difficult to find, in the downtown core,” Canderel executive vice-president Ben Rogowski said at the May 3 Land & Development Conference at the Metro Toronto Convention Centre. Rogowski added that municipal politicians in the suburbs are generally happier to speak with developers than their downtown counterparts, which can make projects easier to build in outlying areas. Those thoughts were expanded on by others on the panel. “We’re seeing lower inventories of high-rise because that low-hanging fruit, those large parking lots, are all gone,” said Menkes Developments Ltd. high-rise residential vice-president Jared Menkes. “There are a handful of them left and they’re already owned by developers. A subway stop and transit hub slated to open before the end of the year within close proximity to the Vaughan Metropolitan Centre, at Highway 7 and Jane Street north of Toronto, presents opportunities for condo developers, as will increased public transit coming to Mississauga. Another challenge for longtime private developers in Toronto, according to Rogowski, is much more competition from upstart smaller developers, real estate investment trusts, pension funds, insurance companies and out-of-market groups to acquire land and buildings in an attempt to capitalize on the city’s booming real estate market. “There are so many guys that have become developers who’ve never had a hiccup,” said Cranson Capital founder and president Devon Cranson. “It’s been up and up and up because they’ve been in business for seven years or less. “If you have deep pockets and the right partners and you understand your costs and how to communicate with your buyers and employees, I think you’re going to be quite successful,” offered Menkes. While Cranson said his company typically dealt with high-rise condo developers seeking money for their projects in the past, he and his competitors are now seeing many more mid-rise townhome developers. Menkes believes there’s a huge opportunity for mid-rise condos in established neighbourhoods. He added that some developers are taking a more responsible and longer-term approach with their condos by making bigger suites and including family-friendly amenities such as kids’ rooms and outdoor play areas. The Rockport Group started as a suburban single-family homebuilder in 1957. It has since moved into the 416 area code and begun to specialize in developing mid-rise condos. One of its projects is George, an eight-storey residence with 83 condo suites and eight townhomes in Toronto’s Leslieville area, which is more than 80 per cent sold. The average size of the units is more than 900 square feet and Rockport has extended the living space with what it calls “urban yards,” minimum 100-square-foot balconies finished with porcelain floor tiles, gas barbecues and decorative screens that add privacy while letting in plenty of light. “We learned through a lot of research on that project that there’s a limited supply of condo space for families,” said Rockport principal Daniel Winberg. Small units used to sell first during pre-construction when Cranson started financing condo developers in 2011. Now he’s seeing larger suites selling the quickest in some projects. “Our companies wouldn’t exist for as long as they have if they didn’t accept and embrace change,” said Winberg.